The first sticker shock for National Public Relations came when it had to renew the 10-year lease on its office at 320 Front St. W. in downtown Toronto. In Toronto’s hot property market, the PR consultancy was looking at a 35-per-cent increase in rent. “The only choices were to move to the suburbs where rents were lower— which wasn’t an option for our young work force — or reduce our footprint by a third,” says Royal Poulin, executive vice-president and chief financial officer of National’s parent company, Res Publica Consulting Group Inc.
Then came the next reality: the soaring cost of renovations for the consolidation to two floors from three floors in the same building. “With a budget of about $100 a square foot, we needed to focus on facilitating how people do their work, rather than quartz counter tops and chrome fixtures,” he says. That meant moving from 90-per-cent private offices to open-concept work areas, but splurging on amenities that could increase productivity, such as technology and collaborative spaces including a café, he says. It’s a trade-off facing companies across North America as the costs of refitting offices rise faster than inflation, concludes a study by Chicago-based Jones Lang LaSalle LLP, a commercial property services company. JLL has come up with a report to guide companies. Its Office Fit-Out Matrix report compares the costs of redesign, construction and furnishing expenses for existing office spaces using data from 2,800 projects in 59 U.S. and Canadian cities in 17 industries. Toronto, Vancouver and Calgary ranked among the 10 most expensive cities to outfit an office, while seven cities in Florida were the least expensive for office remakes. The difference in the cost of building open versus closed offices isn’t as significant as the selection of materials and craftsmanship for the goals companies want to achieve, JLL’s study found. 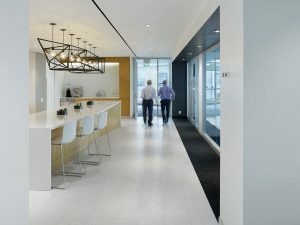 “While shifting to co-working and open collaborative spaces takes down the cost over all, it changes where the budgets are being placed — less on the hard structure and more on equipping the space with a variety of furniture and interesting décor, and adding more technology, connectivity and collaborative spaces,” says report author Mason Mularoni, research manager for JLL. With no private offices and smaller work stations, there’s a need for amenities that weren’t common in the past, including interactive kitchens and living-room style spaces with sofas and tables. While the costs — all in U.S. dollars — can vary based on the condition of the office before renovation, the study compares what it takes to achieve different levels of quality and complexity. 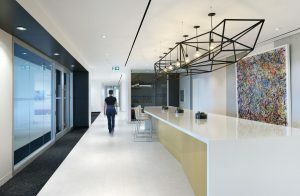 For instance, in downtown Toronto (where the average asking rent is $60 a square foot, compared with a Canadian average of $17.22 a square foot), a “progressive” renovation on a tight budget will average $133 a square foot for an open floor plan with no enclosed offices, bench-style desks and some conference spaces. A “moderate” style — adding 10-per-cent enclosed offices and more collaboration enclosures — raises the average cost to $139 a square foot. A “traditional” design — with 30-per-cent enclosed offices and eight- by eight-foot cubicles — comes in at an average of about $157. The study found the level of customization chosen affects prices more significantly. The open office with basic materials and finishes rises from $133 to $169 with superior-quality materials, lighting and decor, and goes to more than $206 with top-quality finishes and an emphasis on aesthetic details. Over all, the cost of renovations in Canada rose an average of 4 per cent in 2017 and a big reason was labour costs because of competition for skilled workers. As demand has increased, competition is driving up hourly wages, says Nick Joosten, Canada lead for JLL project and development services in Toronto. Costs for each style of renovations in 2017 were nearly identical in Toronto, Calgary and Vancouver, but a few dollars less per square foot in Montreal. A bigger difference is in the comparison of tenant improvements allowances (TIAs) — the portion of the upgrades landlords are willing to commit to provide to entice tenants to sign a lease. These allowances rose by an average of 10 per cent in 2017 across North America as companies moved to better quality space and existing offices were vacated by former tenants or new projects opened, the study found. That trend was notable in Calgary, where TIAs averaged $32, and Montreal, where they were $40 a square foot, which are close to the U.S. and Canadian average of $44. However, in highly competitive central Toronto and Vancouver, landlords didn’t have to be as generous. In Toronto, the average TIA from landlords was just $18 a square foot, and in Vancouver $28. They compared to TIAs as high as $105 in Washington D.C., $90 in Los Angeles and $75 in New York and Chicago. “Because major office renovations only happen once every decade or two, the rising costs of materials and labour generally come as a jolt to managers. It’s particularly eye-opening for startups that are moving from basic to a more corporate look in their workplaces,” says Kevin Katigbak, senior workplace strategist for the Toronto office of Gensler, an architectural and planning firm (which advised National on its remake). Meticulous planning kept costs in line, Mr. Poulin says. National started planning its renovation a year and a half in advance of starting work. Downtown will continue to have more demand than supply for larger downtown office spaces until at least 2020, with gross rates in the financial core hitting as much as $70 a square foot, according to statistics gathered by JLL. Despite that, vacancy rates are rising in Toronto’s suburbs as companies there downsize or look to relocate downtown. Rents will continue to climb as companies continue to grow and relocate. A limited supply of quality contiguous space is predicted to continue until new office projects come online in 2021. Despite much stronger activity in recent quarters, Montreal is unlikely to experience much growth in the coming year as the market still has a relatively high level of availability in existing inventory. A federal exodus from the downtown market is expected to leave several hundred thousand square feet of supply looking for new tenants in the next 24 months. A continuing recovery in Alberta’s economy is expected to result in a slight increase in office demand, but Edmonton remains a tenants’ market this year with vacancy rates experiencing little change. At least two quarters of negative rental activity are predicted, unless there is a surge in the price of oil. Meanwhile, the energy industry may still see more merger and acquisition activity through 2018, potentially putting even more space on the sublease market.